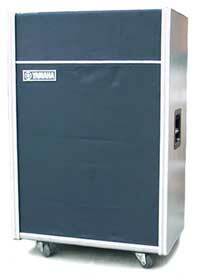 Yamaha rotating horn combo amplifier. Vintage "Leslie effect" keyboard amp. Controls: Volume, bass, treble, reverb, tremolo speed, tremolo control (foot pedal or hand switch), voice on/off, tremolo/chorus. Other fittings: pilot lamp, power switch, input jack, external speaker socket. Speakers: 4 x JA3502A 12" cone driver plus 3 x JA1701B rotary horn driver. Amplifiers: 3 x ND90G 90W solid state amps (1 for horns & 2 for 2 each 12"). Finish: Grey leatherette, black grill cloth, aluminium trim.